Green Lane Mosque (formerly Markaz Jam'iyyah Ahl al-Hadeeth) is an Ikhwani organization that is tied with Ihyaa al-Turath al-Islami, another Ikhwani organization, of Kuwait. Salafis have been warning against their devious manhaj for over 15 years and as the days pass by their realities become clearer and clearer. We take this opportunity to warn the Muslims in general from being deceived by them and to avoid their conferences in general, and the imminent one in particular. They have invited a singer who is utilizes the ways of the Mutasawwifah (Mishari al-Efasi) and also has connections to Ihyaa al-Turath al-Islami. Also invited are Ikhwanis such as Waleed Basyouni, Tawfique Chowdhury and others. What is the ruling on listening to the remembrances of the morning and evening (recited) in a melodious (entertaining) way, such as the cassette distributed now in the markets of al-Mishari al-Efasi? مشاري العفاسي من المفتونين بمسلك المتصوفة ولهذا فإنه ينتهج الأناشيد المصحوبة بالتمثيل ومثله لايجوز الاستماع إليه وعليكم بالقراء من السلفيين مثل الشيخ علي الحذيفي. Mishari al-Efasi is from those put to trial by the way of the Mutasawwifah. For this reason he takes the path of anaasheeds accompanied with acting and the likes of this is not permissible to listen to. Upon you is to (turn to) reciters from the Salafis such as Shaykh Ali al-Hudhayfi. Is it permissible to listen to al-Efasi, where there is a specific satellite channel that broadcasts his anaasheed. Subhaanallaah. I have said that the poetic recitation of the Sufis is not allowed. But if this poetic recitation is that of the bedouins, meaning like poetry he recited in his own distinctive style, then there is nothing preventing this, and poetic recitation was made in the presence of the Messenger of Allaah (sallallaahu alayhi wasallam), however the poetic recitations of the Sufis, this is a bid'ah. Mishari al-Efasi has been known to cooperate with people like Tariq al-Suwaydan in the past and he has participated in gatherings (that include entertainment) organized by the wife of Tariq al-Suwaydan. In 2006, Mishari al-Efasi published a nasheed of some poetry written by a Sufi by the name of Mahmood Hasan Ismaa'eel on his website which contained strange words such as "We will not drink except from the light (nur) of Allaah." 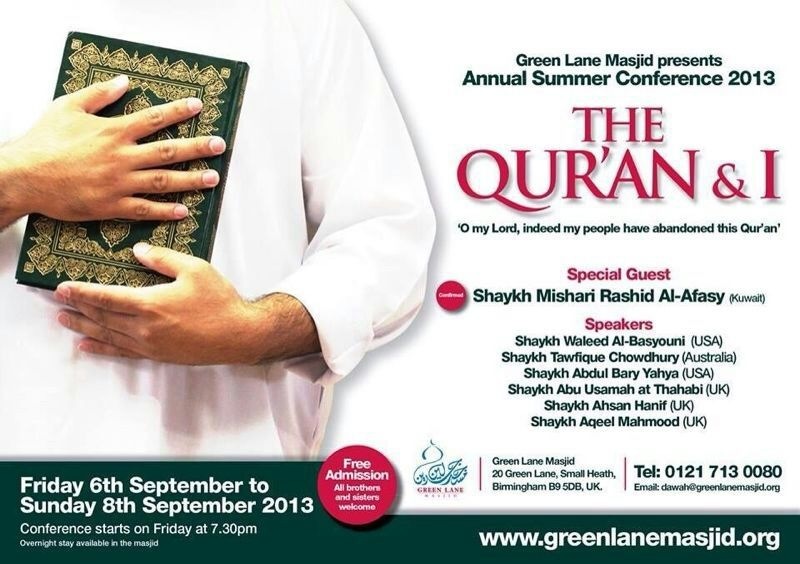 So what is it with Green Lane Mosque that they invite people put to trial by the ways of the Mutasawwifah? Both of these are Ikhwanis and historically they were upon the path of the Qutbi, Ikhwani Ali al-Timimi - a fanatical supporter and defender of the innovator Abd al-Rahman Abd al-Khaliq (who innovated tafarruq in the Ummah as a legislative principle, pushed the innovated fourth category of al-Haakimiyyah in Tawhid). In the year 2000, in Detroit, Walid Basyouni described the refutations against Sayyid Qutb and Hasan al-Banna and the Ikhwan in general (found on the SalafiPublications.Com website) as (كلام فارغ), "empty speech." As for Tawfique Chowdhury he is on a similar path ever since he got put to trial by Ali al-Timimi and his likes towards the end of the 90s. He was also a signatory to that infamous pledge with the Jahmiyyah and Qubooriyyah a number of years ago. These are callers to misguidance, they do not connect the youth to the Scholars in truth and they push forward their own opinions and views in grave and serious matters, and listing aspects of their misguidance would require separate articles. One should note that Tawfique Chowdhury has been invited to Green Lane Mosque (then Markaz Jam'iat Ahl al-Hadeeth) previously, many long years ago, at a time when the Salafis were warning against him as an Ikhwani. We advise the Muslims at large to avoid this gathering so as to protect their ears, hearts and minds from listening to these people for they will disease the hearts with their shubuhaat. Further, we advise the Muslims to take caution from the Green Lane Mosque for they put people to trial in their deen and they are part and parcel of this new network of groups and organizations who are turning da'wah into entertainment. Historically, they have been affiliated with the Jam'iyyah Ihyaa al-Turath al-Islami of Kuwait, an Ikhwani organization that uses deception, showing a face of Salafiyyah outwardly, whilst operating and pushing the methodologies of Ikhwan in reality.